TOKYO (AP) — The head of an IOC inspection team urged organizers of the 2020 Tokyo Olympics to be more direct answering questions about progress and planning on Tuesday. 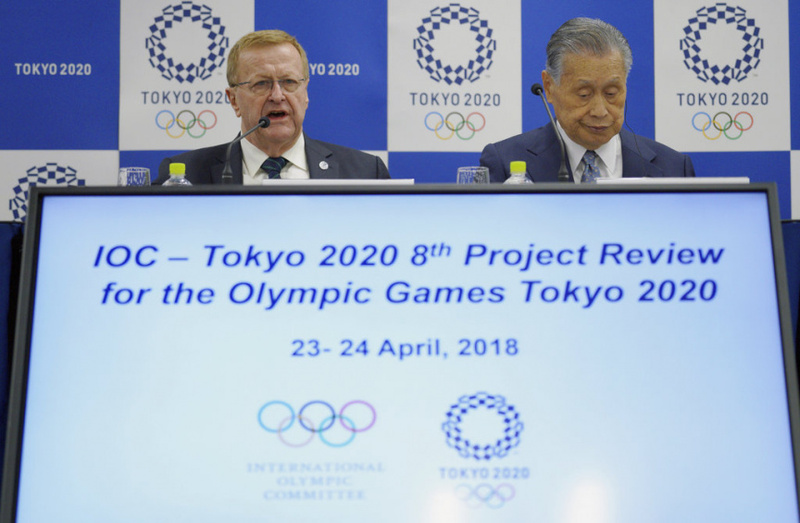 The advice from John Coates, which followed a two-day inspection tour, came a week after several sports federations openly criticized Tokyo's preparations. The games are just over two years away. Coates said work is largely on track, but said organizers have hesitated to fully explain their planning. Coates hinted at cultural differences between his direct Australian style and the more reserved Japanese. "You just have to answer the questions, and be forthright in doing so," Coates said, sitting next to organizing committee president Yoshiro Mori — a former Japanese prime minister — and CEO Toshiro Muto. They both sat still and showed little emotion. "It might not always be in your nature, but I think the questions are going to increasingly come," Coates added. Mori was asked about the advice Coates gave him in private. "There were so many items," Mori replied. "Some specific advice. I don't think I'm able to single out one point, or two points. There were many points." Unlike some Olympics, expectations are high that Tokyo will deliver efficiently and on time. But organizers have hesitated to explain their progress to the satisfaction of some sports federations and national Olympic committees. That prompted direct questions last week from the heads of world sailing, judo and triathlon. World Sailing head Andy Hunt suggested planning for his event might be a year behind and complained about problems with fishing fleets working in what will be the venue for sailing. "There are a number of things where they (organizers) are making great progress, but until it's finalized they will not present it," said Christophe Dubi, executive director of the Olympic Games. "That's the issue." Coates warned that organizers could be bombarded with questions when 206 national Olympic committees meet in November in Tokyo. "They'll want to know about the best arrangements for their athletes," he said. "Now we're down to all the little things — those little things that could mount up." Mori said he was worried about eventually hosting a delegation from North Korea at the Tokyo Olympics. He brought up the unresolved issue of Japanese citizens abducted decades ago by North Korea — and unreturned. "Japan is close to the Korean peninsula — neighbors — and we are living under the threat of nuclear weapons," he said. "We have lived under a difficult situation." He said Japan had been "betrayed" before by North Korea. "It happened in peaceful times. Japanese citizens were abducted," he said. Coates said Japan is obligated under Olympic rules to accept a North Korean sports delegation at the Tokyo Games. "That's not to say a host government does not have control over who it invites in terms of political leaders and people outside the (sports) delegation," Coates said. Tokyo organizers have said the Olympics will cost 1.35 trillion yen — $12.4 billion at the present exchange rate. In addition, Tokyo's municipal government has said it will spend an added 810 billion yen ($7.5 billion). That spending is for projects described as being "directly and indirectly related the games" and brings overall games spending to $20 billion. About 70 percent of the total spending is from public money.